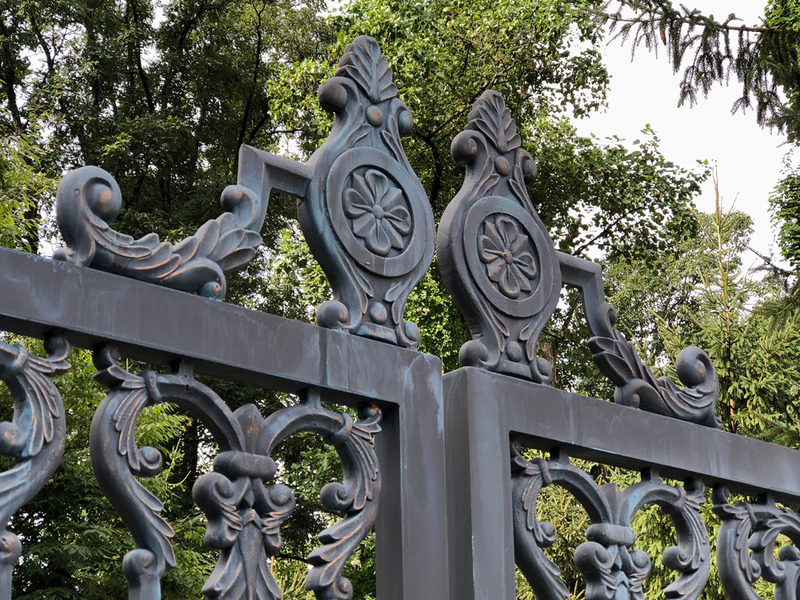 We were contacted by a New Jersey homeowner that desired a driveway gate for the entrance to his exceptional property. They wanted to match this bronze railing design and pull more design elements from the architecture of the house. The acanthus molding, rosette’s and concave trim detail were all used for inspiration. 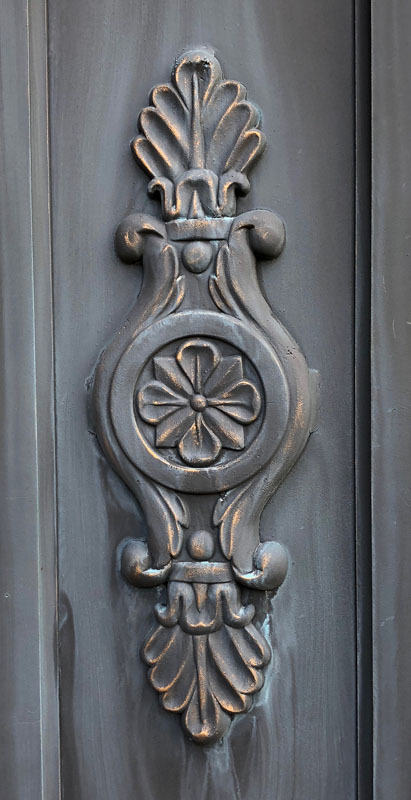 Gate design renderings were created and visual elements were custom designed such as castings with rosette centers swathed with leaf ends. Trim molding details in aluminum were added to keep the driveway gate design at the same caliber of the architecture. All gate design was done in-house. They wanted to simulate the same patina as the bronze, but utilize a more cost-effective aircraft grade aluminum. This required a creative paint process. First blasted, then a dark bronze latex paint was applied. After that a slight mist of water was applied and then specially blended paint was applied with a misting and drip technique to provide the visual of actual bronze with the elements and rain washing over it. And the transitioning patina created realistic effects, topped with some gold highlights to complete the conception. 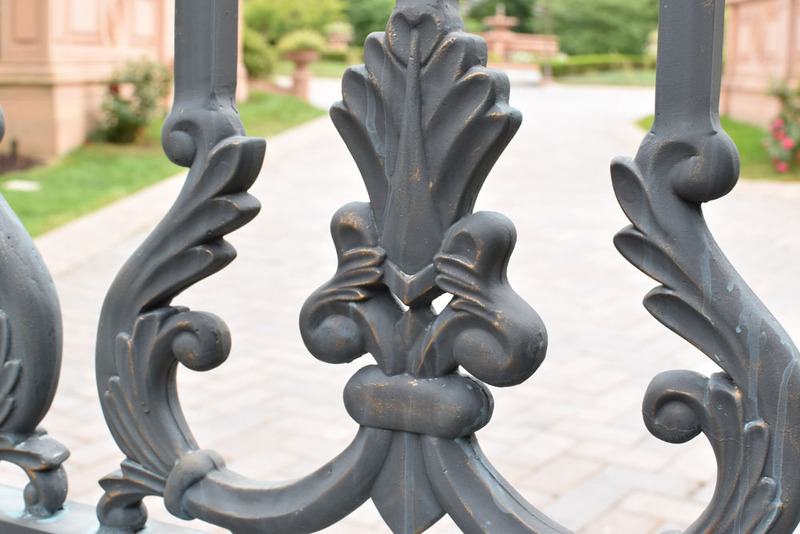 As these estate gates were being created here in the shop and went through their transition to a bronze color, visiting clients absolutely raved about the character and realistic ambiance of these phenomenal driveway gates. And as part of our package, we did all the automation and gate openers for a very high caliber driveway gate and property security combination project in an affluent New Jersey neighborhood.